The form of this creature is taken straight from Chinese, Ming, porcelain. 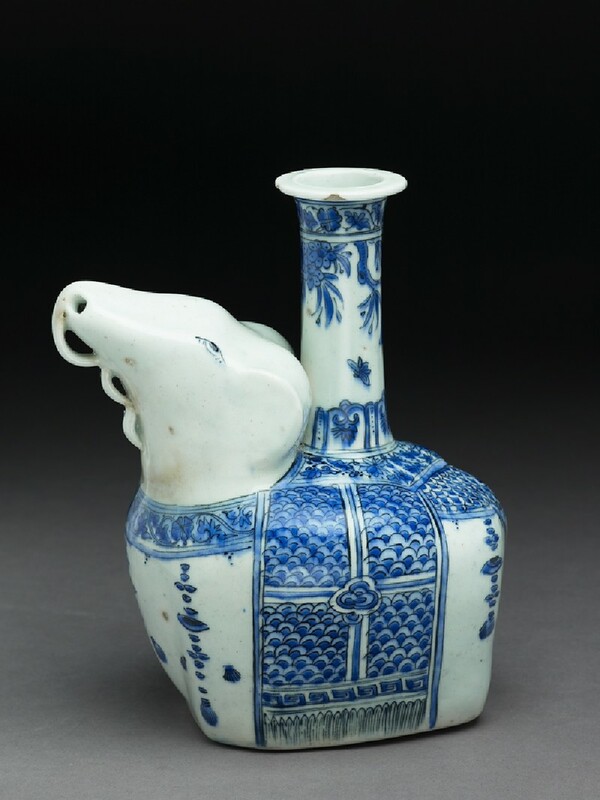 The Topkapi Treasury contains no less than ten late sixteenth century Chinese elephant kendis, while there is also an example in the collection of Chinese porcelain presented to the Ardabil Shrine by Shah Abbas I in 1617. The Chinese kendi derives from the Buddhist drinking vessel known as a kundi, and elephant kendis were presumably exported westwards in the late sixteenth century in the expectation that they would be popular with Buddhist taste in the Indian subcontinent. In Iran and Turkey they seem to have made no impact on local drinking habits, and were probably used for purely decorative purposes. On the other hand, Persian potters felt perfectly at ease decorating an object in a Chinese manner without necessarily adopting a Chinese shape. In the second piece [EA1978.1722] the potter has used the Chinese pictorial tradition and Chinese patterns on an object derived from a Persian metalwork bowl with a lid. However, the potter has transformed the object into a jar by sticking lid to body – hence the double rim around the shoulder, and removing the inside of the handle to create a narrow mouth. Shapes used by the potters, whatever their origin, happily underwent modification without reference to the originals. Thus, this jar shape became increasingly curvilinear as the century progressed, and was eventually fluid enough to lend itself to the more vertically-orientated, flower and plant designs of the lustre potters, who duly adopted it (see below [EA1978.1718 & EA1978.1719 & EA1978.1720]). R. Krahl, J. Ayers, Chinese Ceramics in the Topkapi Saray Museum (London 1986) Vol. 2 nos. 1294-5.